Lady Hornets shut out by Towanda. Lady Hornets fall to Troy, 3-2. Butters drives in winning run to top Sayre, 1-0. Smith, Kohler headline softball All-Stars. 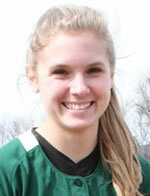 Hornet softball captures NTL West crown. JV softball splits with Canton. Williamson stages big rally late to top Liberty. NEB's Souto, Maddy Johnson headline NTL softball All-Stars. Wyalusing blanks Towanda; Wellsboro clinches NTL West title.